We recently got a blow up 5 foot wide pool for our son who is now almost 18 months! He absolutely loves playing in the pool on a hot day and hates to get out. He normally doesn’t wear a shirt with his swim trunks but he had a lot of sun this day so I put one on for comfort. 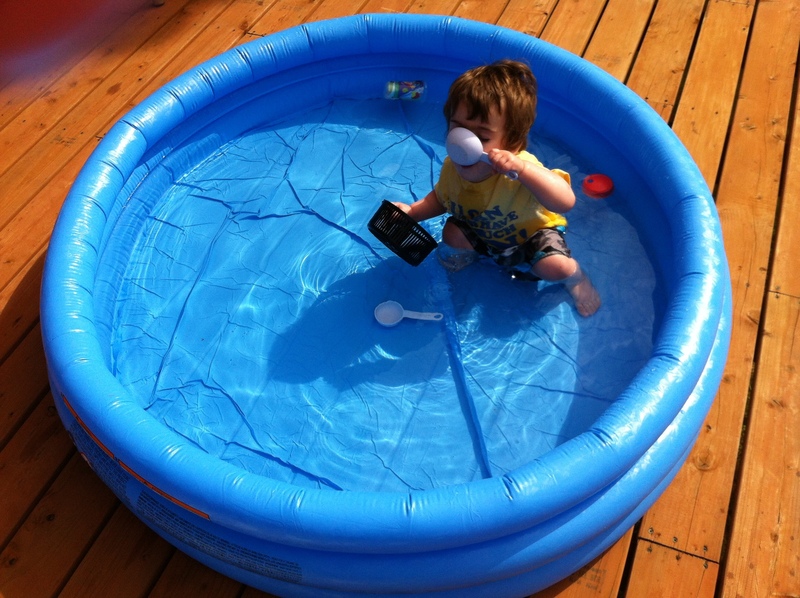 As you can see the pool is new and we haven’t gotten pool toys yet so I improvised using a couple kitchen gadgets! He is playing with a strainer, sippy cups and a few measuring cups which he is thoroughly enjoying! He actually ends up drinking a lot of the water so I encourage him to take his pacifier in with him so he doesn’t drink as much! He loves to jump out and give me a hug to cool me off and get right back in and do it again. I try and teach him to blow bubbles under water but think its a little ok early for that.